The Cultural Arts Council of Douglasville/ Douglas County (CAC) is launching a new initiative to use public art to transform the community into a dynamic center of creativity and a destination spot. The purpose of public art is not only to enhance the community and improve our quality of life through its ability to enrich an environment, but also to ignite the imagination, encourage thought and to prompt discourse. Public art benefits the community through placemaking, bringing people together, and can be used as a tool in economic development. Public art can also strengthen personal connections to one’s community. The CAC’s first project was installing a beautiful public art bench that resides in front of the arts center building and was inspired by the CAC’s Butterfly Garden that is maintained by the Douglas County Master Gardeners and the Ama-Kanasta Garden Club. The bench depicts an array of flowers, hydrangeas, and butterflies with a quote stating, ‘Love One Another’. This was just the first of many public art pieces coming to the community. One of our next projects is called “Be the Change”. 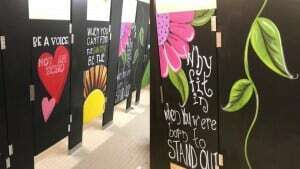 This project is in partnership with the Douglas County School System. Do you want to make a difference in your own community? Donate just $20 to helps support “Be the Change” Public Art Project. 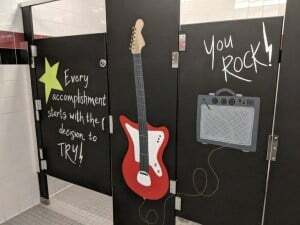 Each of the bathrooms will feature encouraging quotes to remind all students that they are valuable and worthwhile. 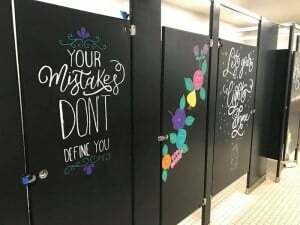 When students in the school have a hard day, instead of stark walls and institutional paint, they’ll be greeted with reminders of their potential. We can all use reminders at times that kindness matters and we are “enough.” If you have any questions about this project or want to learn how you can help sponsor this initiative, please do not hesitate to reach out to us at [email protected]. Click on any “Donate button” to support today!